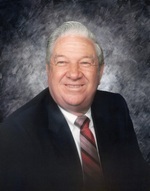 Raymond Crimm Davis of Irving passed away January 19, 2019 in Irving. He was born on November 16, 1925 in Old Glory, Texas to Flavous and Nora (Wood) Davis. Raymond was a true family man who loved every chance to gather his family around him. He enjoyed flying his plane, loved being on the water fishing, scuba diving, and skiing. Raymond was a member of St. Luke’s Catholic Church, the Irving Water Ski Club, Endurance Motorcycle Clubs and RV Chapters, as well as belonging to various charity and professional boards. Raymond’s legacy started when he formed Davis Crane Service with his nephew Bobby Davis in April of 1962 and two “VERY” used cranes. Bobby retired in the early 70’s and Raymond continued, along with his sons, to build one of the largest family owned crane service companies in the country. He is preceded in death by his parents; siblings Archie, Leonard, Ford, Roy, Floyd, Clifton, Jay, Orville Davis; Lillie Elliott, Stella Davis and grandson Wesley Davis. Raymond drew his true strength in life from his wife of 70 years, Bernice. Also left behind are children Kenneth Davis; Dianna Hawkins and husband Dwayne; Mary Davis; Paula Davis Belz; Chris Davis; Robert Davis; Joseph Davis; Teresa Smythe and husband Ronnie; Denice Davis and Dennis Davis and wife Lynne; grandchildren, Tammy and husband Morris; Crystal and husband Jackie; Lisa; H.D. ; Jason; Justin; Jonathan and wife Jennifer; Joseph and wife Karen; Nathan and wife Charli; Kevin and wife Laci; Scott; Amanda and husband Jerry; Austin; Kayley; Hannah; Ronald; Randal and wife Courtney; Ryann; Danielle and husband Jesse; Jordan; Jessica; Julie; and Jared. Great-Grandchildren, Tyler; Taylor; Blake; Emma; Clayton; Savanna; Jon; Jayden; Alex; Logan; Claudia; Liam; Jack; Noah; Bradli; Spencer; Piper; Rowan; Lucas; Lauren; Kaleb; Payton; Cooper; Rylon; Taylen; Jace; Raegan; Great-great-grandchildren, Teagan; Tinsley; Thatcher and Teller and many other loving family members and friends. The family will receive friends from 9:00 am until 11:00 am on Friday, January 25, 2019 followed by a Celebration of Life service from 11:00 at Calvary Church, 4401 State Highway 161, Irving, TX 75038, with a reception following. A Mass of Christian Burial for the family will take place Saturday at Calvary Hill Cemetery Chapel, Dallas, TX with entombment following in the Mausoleum. In lieu of flowers the family requests memorial donations be made to St. Jude’s Research. You may leave the family a note of condolence or make a donation by visiting our website at www.brownmem.com.